CULLMAN – On Monday, Feb. 18, Cullman First United Methodist Church, at 320 Third Ave. SE, will host the 16th annual Empty Bowls of Cullman County Chili Dinner in Hearin Hall. The event, begun by Tanya Shearer in 2003, raises funds for the food pantry at United Way agency Cullman Caring for Kids (CCK). For a ticket price of $10, guests receive hot, homemade chili, a grilled cheese sandwich and a drink, along with a handmade pottery bowl to take home. The bowls are crafted by local potters throughout the year. Southern gospel entertainment will be provided by returning acts Enell Baker, Shannon Green and The Potentials. The annual event typically raises at least $12,000, and in 2017 raised more than $15,000. Through its partnership with the North Alabama Food Bank, CCK can purchase food for the local pantry for around 14 cents per pound; partnerships with local grocers help keep prices low, as well, on items the organization cannot get from the food bank. The 84,000 pounds that the average $12,000 would buy could supply four months of food to CCK, which currently distributes 10 to 12 tons of food to up to 650 families each month. For example, Daniel shared that the Cullman Lions Club, of which he is a member, usually meets on Monday evenings but will be bringing its folks over to the church instead for the event. 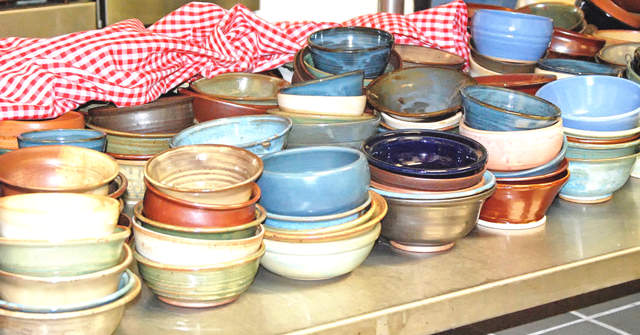 “Empty Bowls is really vital. It’s one of the things that we depend on each year. We just looked up yesterday, that in the 15 years, they have raised over $100,000, I think it’s $111,000, for Cullman Caring for Kids over that period of time. And for each of those dollars, we’re buying the food at the food bank in Huntsville, we could buy 7 pounds of food for each dollar. So yes, Empty Bowls is a very, very vital part of our operation. Monday, Feb. 18, 4-6:30 p.m.
First United Methodist Church, 320 Third. Ave. SE, Cullman, in Hearin Hall at the intersection of Third Avenue and U.S. Highway 278.